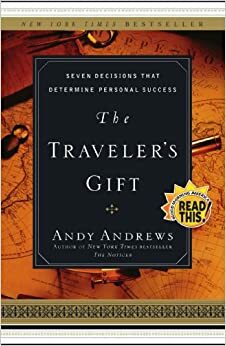 The Traveler's Gift, or in other words, Traveler's Gift the Seven Decisions to Determine Personal Success. This book is a unique blend between history, fiction, allegory, and inspiration. It follows this man on a journey through his hardship, but through hardship, comes success. With the leadership from world leaders, this man learns and finds that all decisions he makes, have good and bad consequences. . . This is an amazing book! Andy Andrews is an extraordinary writer! He wrote many others like The Noticer, The Final Summit, Butterfly Effect, etc. This book is a positive book, but it seems like you are reading a classic. I shed some tears in the ending when the man realizes that all the things he went through was real. He met Abraham Lincoln, Anne Frank, Columbus, and many other inspiring leaders. And for each inspiring leader, came an inspiring lesson. Lessons that are decisions that lead up to success. The Seven Decisions to Determine Personal Success. I think that people who are open-minded, and have a mind for learning, will definitely enjoy this book as much as I do. You can get ready for a few laughs, and a few quiet moments to reflect on what you just read. But mostly, I think everyone CAN read this book, it just depends on if they WANT to. Happy reads!